Navratri celebrations are one of the most important and popular festive occasion for Hindus living all over the world. It is also known as Devi Navratri. It is a festival of worshipping Goddess Durga in her nine forms during the nine days of this festive occasion which generally occurs during the last week of September or the first half of the October month (at the beginning of the Autumn season). According to the Hindu calendar, it is the first nine days of the month known as Ashwin or Ashwayuja when they celebrate this festival. Navratri or Navaratri means nine nights. Even though people perform worship during the morning time also, both at homes and the temples, the most important type of worshipping takes place during the evenings hours in all these nine days. It is also known as Vijaya Dashami as it is celebrated to enjoy the victory of Good over Evil. The festival is celebrated to worship the Goddess who destroyed evil and protected people always in her different forms of appearance. She is mainly worshipped in three most popular forms as the embodiment of Power/ Force, Wealth/ Prosperity, and Wisdom/ Education. Chronologically these are the nine forms of Goddess (or Devi as referred to in Hindu scripts) as per citations found in many scriptures. This is a pure form of energy with no shape whom Lord Shiva worshipped before starting the creation. She appeared on the left side of Shiva. She sits on a lotus and rides on a lion holding Shank, Chakra, Gada, and a Lotus in each of her four hands. After taking the form of Siddhidhatri, the Goddess lived inside the Sun so as to release some of the Sun's energy to the Universe and provide life to the living beings. She has eight hands holding a Kamandalu, Bow, Arrow, and Kamal with her right hands and Chakra, Gada, Japa Mala, Pot of Nectar with her left hands. She also rides on a lion. After Kushmanda's form, the Goddess took the form of a Brahmacharin born to Daksha Prajapati. She was supposed to marry Lord Shiva. But Daksha insults Shiva and she gets self-immolated herself vowing to marry Shiva in her next birth. She holds a Kamandalu and a Japa Mala in her hands and walks bare-footed. After self-immolation, she takes birth as Shailaputri (Daughter of a Mountain named Himalaya) to marry Shiva. She rides on a Bull, carrying a Trishul and Lotus in her hands. Shailaputri, after reaching her age of sixteen years, is believed to be of extremely beautiful with a splendid and sparkling glow. So, she is called as MahaGauri meaning extremely beautiful. She also rides on a Bull with her four hands holding a Trishul in the right hand, A Damaru in the left hand, and making the Blessing sign with the other right hand and a gifting sign with the other left hand. On marrying Lord Shiva, she begins wearing the half-moon sign on her forehead shaped in the form of a bell. So, she is known as Chandraghanta. She mounts on a tigress with her ten hands. She holds the Arrow, Bow, Lotus, and Mala of her neck with four right hands, keeping the fifth hand in Abhayamudra (a blessing sign). She holds the Trishul, Gada, Sword, and Kamandalu in her four left hands, posting the fifth hand in a gifting sign (Varadamudra). Skanda is the other name for Lord Kartikeya, the son of Shiva, Parvati. So, she is called as Skanda Mata meaning mother of Skanda. Skanda Mata rides on a fierce lion. She has four hands. She holds Lotus in her upper two hands and holds her son Skanda (who is a six-headed child) with her right hand. She keeps the other left hand in a blessing mode. Katyayani Mata was formed from the waves of anger exuded of all Gods who have been angry with the atrocities of the demons. 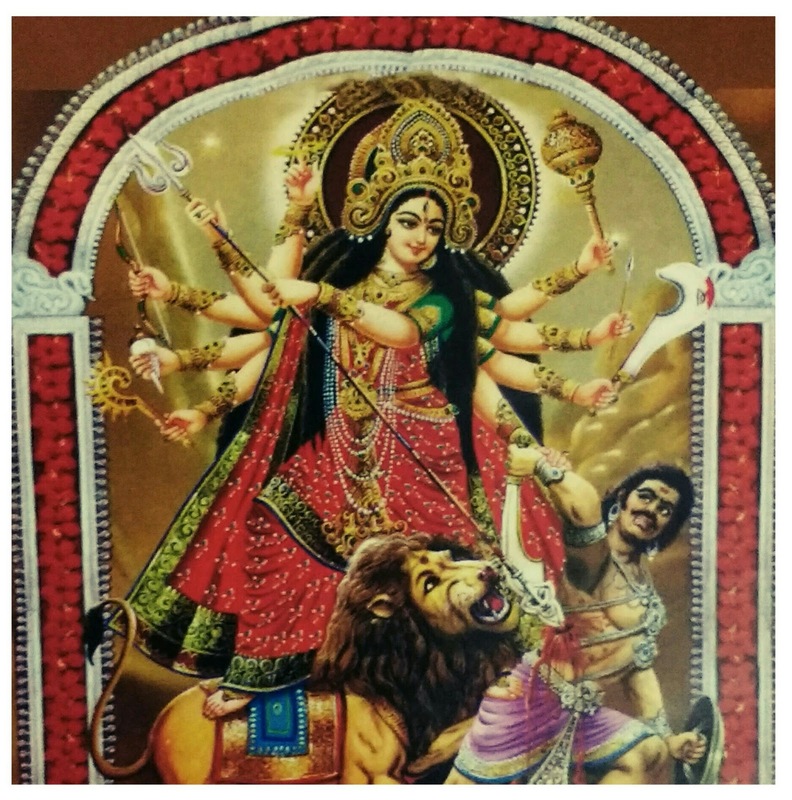 She was entrusted with the task of killing Mahishasura and other demons. She is red in color and rides on a majestic lion. She holds a Lotus and Sword in her left hands and keeps her both right hands in blessing and bestowing modes. This is the most fierce form of Mother Goddess. She is black in color and rides on a donkey killing the deadly demons named Sumbha and Nisumbha in a very frightening manner. 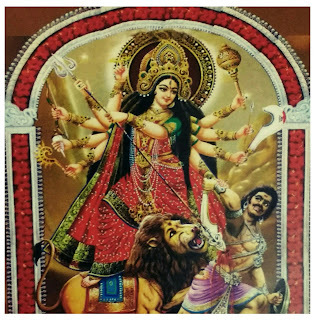 She holds her both right hands in Varada (gifting) and Abhaya (protecting) mudras and carries a huge Sword and fierce Iron hook in her left hands. For more comprehensive details of Dussehra celebrations like Ram Leela and Vijaya Dashami, you may like to visit this article with full details at this link.